At long last, a heroine is front and center in a Marvel movie. In the aftermath of 2016's Captain America: Civil War, Scott Lang (Paul Rudd) is placed on house arrest for violating the Sokovia Accords. 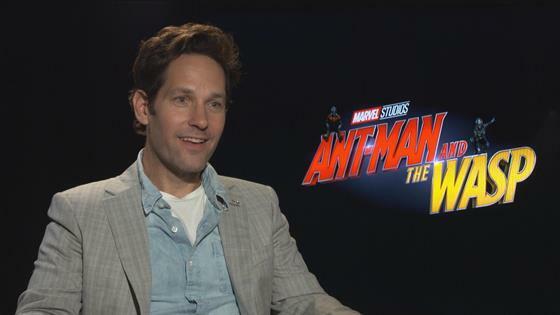 Unsure of how to balance his home life with his responsibilities as Ant-Man, he unwittingly teams up with Hope van Dyne (Evangeline Lilly) and Dr. Hank Pym (Michael Douglas) on a new mission: Rescuing Janet van Dyne (Michelle Pfeiffer) from the quantum realm. That means Scott must suit up and fight beside The Wasp. Up against the clock, Hank, Hope and Scott turn to a deceitful arms dealer, Sonny Burch (Walton Goggins), and Dr. Bill Foster (Laurence Fishburne), one of Hank's former associates, for assistance—and, in at least one instance, it doesn't end well. Their mission only gets more difficult when Ghost (Hannah John-Kamen) tries to steal their technology for her own benefit. Released in 2015, Ant-Man earned $519.3 million at the box office on a $109.3 million budget. Director Peyton Reed is back, as are Bobby Cannavale, David Dastmalchian, Judy Greer, T.I., Michael Peña and Abby Ryder Fortson; Randall Park joins the A-list cast as agent Jimmy Woo. And for those wondering why Scott didn't appear in Avengers: Infinity War, all will be revealed. • "An effects-laden goofball comedy in which anything goes and nothing matters," Ant-Man and the Wasp is "probably the most amusing film the company has made since the Kevin Feige reign began a decade ago," The Hollywood Reporter's Todd McCarthy writes. "The filmmakers are so cavalier about the idea that any of this is supposed to make any sense that there's a certain liberation in not burdening two human-brained insects with the fate of the entire universe. If the filmmakers don't pretend to take the proceedings too seriously, you don't have to, either." To its credit, the film "is reductionist in every way, and what's at stake couldn't be further from what lies in the balance at the conclusion of the studio's recent mega-blockbuster Avengers: Infinity War." There's no hiding that "Ant-Man really is a pipsqueak compared to the A-cast of superheroes," he writes, though "Marvel has done a pretty good job with its B team." • "Sometimes better-than-good things do come in small packages. The proof can be found in Ant-Man and the Wasp, a fizzy treat of a sequel that retains the becoming modesty of the original, but with a timely new twist," Rolling Stone's Peter Travers writes. The plot is "convoluted," but "sparks fly" when the heroes "actually team up, and the FX wizards pull out all the stops so your eyes will pop in wonder." Rudd "is a winning combination of sass and sincerity," and "it's a kick" to watch Lilly "let her star shine," he says. "She hasn't had a part this juicy since she played Kate on Lost; her smarts and screen presence lift the movie over its rough spots." • "This is one of those Marvel products peddling self-aware detachment as a defining narrative strategy," Entertainment Weekly's Darren Franich writes, adding, "Characters joke so much about Captain America: Civil War that you start to wonder if you paid movie-ticket prices to read the internet two years ago. It feels less like a feature film than a meme somebody made about an Ant-Man trailer. It's forgettable, but some things are better forgotten." The larger problem, he explains, is that while Rudd is "a charmer" and Lilly "looks happy to finally have something to do, the story "is too busy, and too removed, to let them have any noticeable chemistry." In fact, Franich argues, "Hope and Scott barely seem to be in the same movie. They're two flavors of heroic blandness. She's resolute, laser-focused on rescuing her mom. He's a snarkbot, perpetually unprepared until he knows exactly what to do to save the day." • "It's nice, for a change, to see a superhero movie in which a big building doesn't blow up. Even nicer to discover that, with the help of a handy remote control, the building can suddenly shrink to the size of a suitcase, small enough to tuck away in the overhead compartment," The Los Angeles Times' Justin Chang writes. "Ant-Man and the Wasp, for its part, proves just as winningly compactible. Its zippy action scenes and trippy bursts of kaleidoscopic color look great in a theater, but in some ways its whimsical sensibility and playful, diverting story might feel just as well suited to the dimensions of your in-flight entertainment screen." Best of all, the "nimbly directed" movie offers fans "something bright and cheery to chase away the apocalyptic torpor of Avengers: Infinity War." Casual moviegoers who aren't experts on the Marvel Cinematic Universe shouldn't be intimidated: "Chances are you won't get too lost here." • "Mr. Rudd could have coasted on his cutie-pie smile and natural appeal, but he fills in the character winningly, imbuing Scott with an easygoing looseness—and a deadpan that teasingly teeters between innocence and stupidity—that keeps his heroics grounded and human," The New York Times' Manohla Dargis writes. "It's funny how little things, like personality, can lift a movie. Ant-Man and the Wasp features kinetic action sequences, but what makes it zing is that Mr. Reed has figured out how to sustain the movie's intimacy and its playfulness, even when bodies and cars go flying," Dargis explains. "He wants (needs) to wow you with special effects." • "Ant-Man and the Wasp has a pleasingly breakneck, now-you-see-it-now-you-don't surreal glee. It's a cunningly swift and delightful comedy of scale...a fantasy of mutating matter in which buildings collapse into Monopoly toys, a Hello Kitty Pez dispenser gets inflated into a freeway battering ram, and the most fearless of the characters is injected into an ocean of psychedelic sub-atomic protoplasm," Variety's Owen Gleiberman writes. Reed, primarily known for directing comedy films, "has learned how to operate the heavy machinery of a Marvel superhero movie yet keep it all light and fast and dizzying." Sure, the stakes are low compared to other MCU movies, but "part of the fun of Ant-Man and the Wasp is that you don't have to pretend there's anything cosmic at stake. How could you? The plot is an elaborate throwaway." • "While Ant-Man's technically 'the star,' this is most definitely the Wasp's movie to own, and the smirking, enjoyably no-nonsense role fits Lilly well. It's all romantic tension and witty banter between Scott and Hope, who needles him about his semi-Avenger status: When he gets stuck the size of a kindergartener, she chides him, 'If only Cap could see you now,'" USA Today's Brian Truitt writes. "Her verbal jabs pack as much punch as her fighting ones, and after spending the first movie with her as a capable woman yearning to be a superhero, watching Wasp finally take flight and foil bad guys with a ginormous Hello Kitty Pez dispenser is a cathartic blast." • "Visually, Ant-Man and the Wasp gets close to Doctor Strange levels of trippiness, particularly in that sub-atomic world where Janet is trapped. From random and kaleidoscopic fragments of light to some enormous, threatening dust mites, the film creates a whole weird and wonderful world that we can't see," The Wrap's Alonso Duralde writes. "Ultimately, the film is hard to take seriously, even by MCU standards; we don't really doubt whether or not Janet will be found since, hey, there's Michelle Pfeiffer on the poster! But for audiences who like Marvel movies at their tongue-in-cheekiest, this sequel provides some breezy fun while we wait to find out just how permanent [Avengers: Infinity War villain] Thanos' genocidal schemes really are." Stick around after the movie ends: Ant-Man and the Wasp has mid- and post-credits scenes.